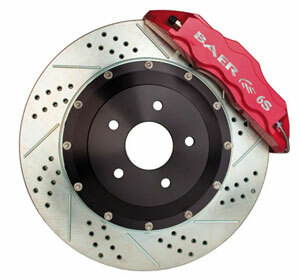 The Extreme+ is Baer's flagship offering, featuring a forged monoblock caliper that is mounted to a 14" two-piece rotor. The Extreme+ employs current state-of-the-art race technology usually only found in very expensive race calipers, that Baer now brings to the road going/street market. The 6S line represents Baer's most aggressive road offering and is suitable for virtually any level of track use. If you are looking for the best of the best, this is it. Note: Must use CPP Modular spindles.